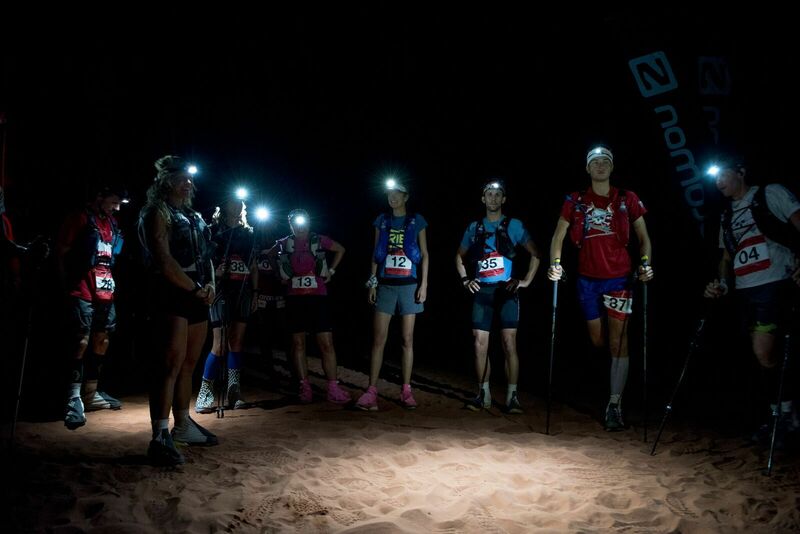 Charlie Hen­son exploded into the ultra-run­ning scene in this years Wadi Rum (Ultra X Jordan). Hav­ing nev­er ran fur­ther than a mara­thon before he sur­prised even him­self to get stronger each day and fin­ish the race in second place, and the fifth day only 2 minutes behind the great Salameh Al Aqra. 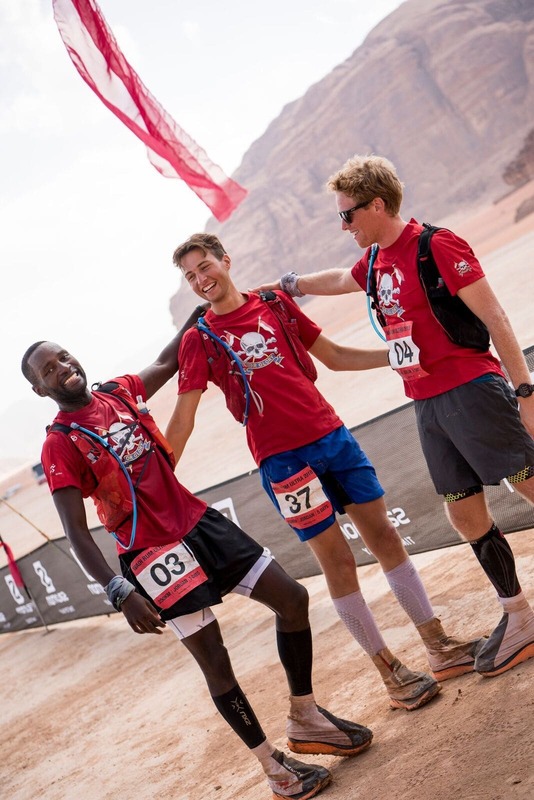 Ultra X caught up with Charles to find out a little about how he went about pre­par­ing for the event, why he thought it went so well and his plans for the future. Charles was rais­ing money for Help the Her­oes (link to fun­drais­ing attached below) along with fel­low team mates and Roy­al Lan­cers Juli­en Anani- Isaac and Toby Free. Tell us a little about your sport­ing back­ground? Have you always been a run­ner? I ran the Lon­don Mara­thon back in 2012 but oth­er than that have not really done any dis­tance run­ning. That said I have always enjoyed it to keep fit. Oth­er­wise I love play­ing hockey and pretty much any­thing on the back of a horse. Describe your train­ing in the run up to the event? I star­ted train­ing about 6 months out. I was not par­tic­u­larly sci­entif­ic about it but just fol­lowed a few golden rules. I always ran at least 53 miles a week (10 miles, 10 miles, 20 miles, 13 miles), rising to around 60 in the last few weeks. This dis­tance was chosen fairly arbit­rar­ily; it was just what I was able to fit in around my work sched­ule at that time. I always ran dur­ing the hot­test part of the day wherever pos­sible, and was lucky to be liv­ing in a hot coun­try at the time. I stretched and foam-rolled for 30 minutes every morn­ing and even­ing. I took my nutri­tion ser­i­ously for the first time in my life, eat­ing as health­ily as I could. I actu­ally did a ketos­is type plan with low carbs and high levels of healthy fat. I found this worked well but would urge oth­ers just to find what works and makes you feel strong and healthy to go and run week in week out, what ever that might be. Two weeks out I ran a 50K Ultra Mara­thon in the moun­tains in Cyprus with my team­mates Juli­en and Toby. This was a great way to see how far we had come and focus our minds for the big event. For the two weeks before I did very little, just a couple of short runs, stretch­ing and eat­ing plenty. What equip­ment worked well for you dur­ing the race? Poles worked really well for me. I found they allowed me to take the weight and strain off my legs and help me through the more pain­ful peri­ods. 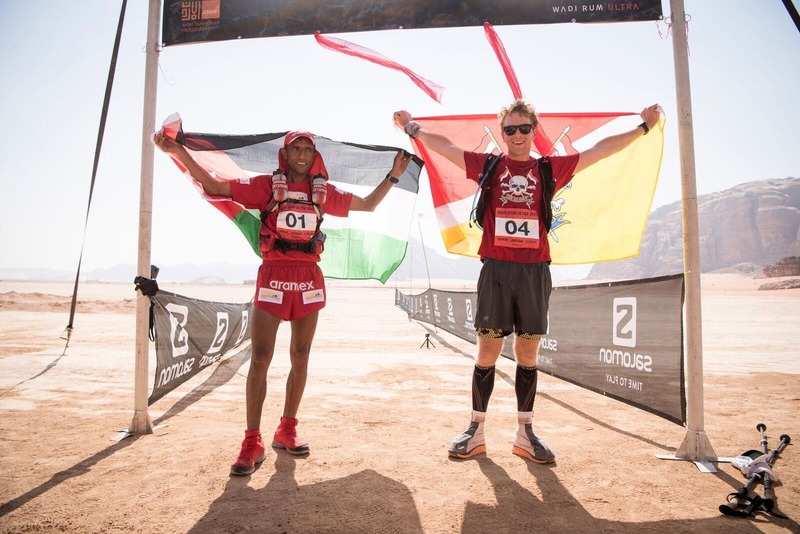 My train­ers and gaiters (Hoka One One Chal­lenger ATRs, Raid­light Desert Gaiters) were awe­some through­out. I did not get a single grain of sand inside and only a couple of blisters. What was your nutri­tion strategy dur­ing the race? I had learnt in train­ing that I really do not like gels. I nibbled on Droe­wars and Ember biltong in the early miles which I adore and keeps me feel­ing strong. Then later I would have Bounce Pro­tein Balls and Vela­forte Energy Cubes. Everything pretty nat­ur­al which I found pre­ven­ted me feel­ing unwell or hav­ing to ride an energy roller­coast­er. Elec­tro­lyte solu­tion and salt tab­lets through­out seemed to keep me feel­ing rel­at­ively human. If you were to go back 6 months is there any­thing you would change about your approach to and strategy dur­ing the event? Without doubt the speed I set off on the first two days. I let the excite­ment and com­pet­i­tion cloud my bet­ter judge­ment and it just made for very pain­ful final stages and prob­ably slower times any­way. Over the course of the race I found that the best way for me was to find a nice slow rhythm that I felt I could main­tain all day. I would relax and enjoy the view until the last 10km. At that point I would put my head­phones in, play my Heavy Met­al playl­ist and see what was left in the tank. Are there any bits of advice you would give to people doing an Ultra X event in the future? I think hav­ing good admin is really key. When racing and when you fin­ish each day it is so import­ant to be able to grab everything you need read­ily and eas­ily. Going through a set routine when you fin­ish too; know­ing exactly what you are going to eat, drink and do to get your­self the best pos­sible recov­ery. This is not just about per­form­ing the next day, it makes it easi­er to relax, stay calm and enjoy the down time hav­ing a plan in place. Oth­er than cross­ing the fin­ish line, what where the main high­lights of the week for you? Without doubt enjoy­ing the com­pany of my fel­low com­pet­it­ors and the Ultra X team. Both in camp and dur­ing the race. Through the amaz­ing exper­i­ence shared we quickly became like a fam­ily and they were all such inter­est­ing and inspir­a­tion­al people. Set­ting off in the dark for the long day with the stars out and see­ing the sun rise was also really spe­cial. Ultra X Mex­ico. A mate is get­ting mar­ried on 20th April or I would be there in Sri Lanka!